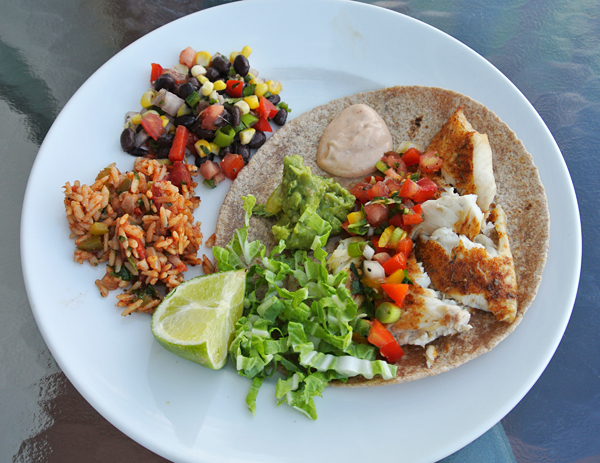 We love seafood tacos of any description, and recently when planning our family Mexican Fiesta, we made these tasty fish tacos using tilapia, an inexpensive, mild tasting white fish. You can use any type of toppings for your tacos, but we like shredded napa cabbage, a spicy chipotle cream, fresh guacamole, and my homemade pico di gallo. We used whole wheat tortillas for our tacos to improve the nutritional value, but feel free to use corn tortillas instead if you prefer which are healthier than simple flour tortillas. Tilapia cooks very quickly so we chose to cook it in frying pans on top of the stove, but you could also grill or broil it if you prefer. White fish is a low fat, healthy protein. Choosing whole wheat or corn tortillas over flour tortillas add nutritional value to this entree. Pico de Gallo, guacamole, and cabbage are all heart healthy topping options. 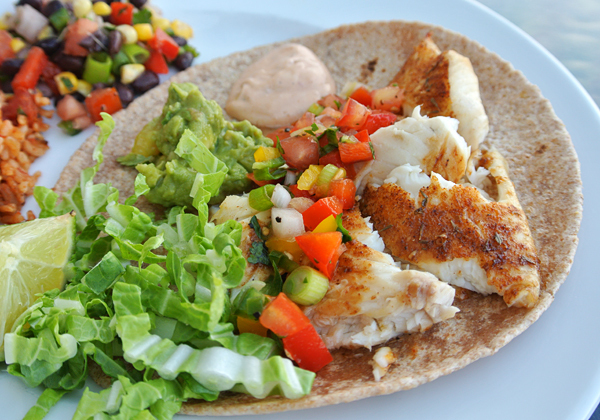 Fish tacos are a heart healthy fun entree for the whole family. Mix together the dried seasoning mix in a small bowl and then pat onto the fish fillets and refrigerate for an hour or two. To make the chipotle cream, mix half the chipotle peppers with the sour cream using a blender or hand wand. Season with salt and pepper and taste, and add additional chipotle if you would like more heat. Refrigerate the chipotle cream until ready to use. To cook the fish, heat the oil in a large skillet, and cook the fillets for about three minutes per side until cooked through. Serve the fillets in pieces on the warm tortillas and pass the cabbage, lime wedges, guacamole, and pico de gallo as toppings for guests to choose as they prefer.